There are times in my life that I need to remind myself that no matter how trivial my career seems in the grand scheme of things, banjos are my particular specialty. Building, playing, repairing, listening tweaking; an endless cycle in the continuing quest for the perfect banjo sound.Tone components placed within my Heli-Mount construction are unencumbered with hardware and neck attachments and are therefore free to produce a purity of tone that is unique to Nechville instruments.This fact is what excites and motivates me along my journey. If, for example, you wanted to test all the various types of tone rings, you would have a very big job indeed. Different weights, shapes and tone ring material compositions offer countless options. If you combine the myriad of different rim constructions, types of heads and bridges you face a limitless expanse of potential tone combinations. With a bit of knowledge and intuition, exploring the universe of banjo sounds is great fun! I love my job. One relatively unexplored region of banjo space has recently reopened to me. The long neglected Bronze Heli-Mount, originally cast in 1987 has been dusted off and outfitted with an antique maple 3 ply rim and a Nechville made experimental tone ring. The discovery of this particular combination justifies all my exploratory work. It speaks with a luscious voice that removes all doubt that banjos are destined to grow and thrive upon this planet.If you are interested in knowing more about the one and only Bronze Heli-Mount, or the other pieces in Nechville’s private collection, you contact me at [email protected]. I see banjos as mankind’s gift to a happier future. 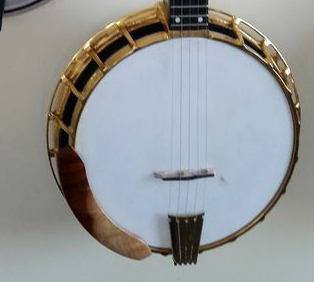 If you build, play, teach, perform, listen to, learn or just appreciate the banjo, you may want to join me in supporting the vision of the Banjo Revolution.